Are you considering placing your home on the market? Did you know that cleaning the surface of your home’s facade can instantly boost the value of your home? Since real estate agents and buyers are attracted to homes with great ‘curb appeal,’ the surface of your home may be a major factor in it’s price tag. Curb appeal refers to the first impression an onlooker gets when looking at your home. It’s the appeal of the home from the curb of the road. If that onlooker is a potential buyer, it’ll be important to ensure that your home is looking pristine. A clean home with a clean building envelope will simply look more valuable than a dirty, grimy, dusty home. Plus, renewing the exterior of your home makes it look newer. With a good power wash from the pros here at Big Clean, you can expect a bigger price tag on your home. In fact, pressure cleaning your home is likely the most affordable way to boost the price tag of your home; and it only takes a few hours! While you’ll have to shell out a few dollars upfront, you may get thousands more on the selling price of your home. That’s a phenomenal margin. If you’re ready to put your home on the market, but you’d like to squeeze every dime out of the old abode, consider pressure washing the facade. 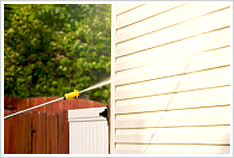 Big Clean provides power washing services for homes throughout the Charlotte area. Give us a call today to earn a free quote on your facade cleaning, and to book an appointment!